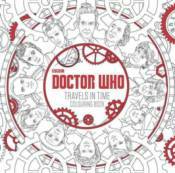 Experience the timey-wimey travels of the Doctor moment by moment with this historical Doctor Who colouring book. Inside you'll find the Doctor's greatest friends and foes from throughout all of history, with original illustrations featuring Churchill, Shakespeare, Van Gogh, Dickens, Madame de Pompadour and many more. Colour in kings and queens, Romans and Egyptians, Viking villages and erupting volcanoes ...not forgetting the occasional dinosaur on a spaceship. With 45 brand new images to colour, Travels in Time is a fantastic addition to any colouring collection.